Do you want to make a special treat that when you eat it, your body will know how to metabolize it and not make you feel tired, irritable and bloated? Try these Dark Chocolate Truffles. This picture comes from a client who made them for her work party. Don’t they look fabulous! Download your Healthier Holiday Desserts today to get more recipes like this! 1. Puree the avocado in a food processor or blender. 2. In a separate bowl melt the chopped dark chocolate. Be careful not to burn the chocolate (If you’re microwaving it, stir it every 20-25 seconds). 3. When chocolate is completely melted, stir in the sugar. Whisk together to try to dissolve the sugar. 4. Add in avocado and vanilla, Mix again. 5. Put in the fridge for about 30 minutes. 6. Rolling out the truffles is the hardest part of the recipe! Keep a small cup with warm water. Place a metal spoon in the warm water for about 20-30 seconds before trying to scoop out the truffle mixture. 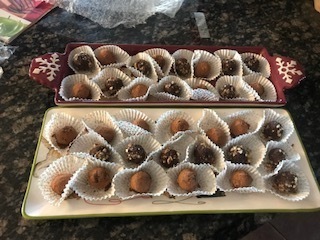 Roll the truffles into small balls. 7. In a separate bowl, put 1 tbsp of unsweetened cocoa powder (you can always add more). 8. Roll the formed balls in the cocoa powder to cover them with a light dusting. 9. Put 3 or 4 truffles in a cupcake liner, but you could get smaller baking liners and they would work too. 10. Keep the truffles in the refrigerator to preserve freshness and try not to eat them all in one sitting.